Think about the city or town where you live. You sleep there. You shop there. You go to school or a job there. But how much living do you actually do in your city itself? Do you feel like you can hang out on the sidewalk, take in the sights, enjoy conversations with your neighbors, meet new people? In many cities in America, people travel and work in their cities, but do most of their living at home or at a community asset like a park. For some, a park is not always near enough to take advantage of with any regularity. That’s why we love the parklet concept. A parklet is an extension of a city sidewalk where people can relax and hang out. It might be sponsored by a nearby business, but it is truly public space – no pressure to purchase the sponsor’s products. 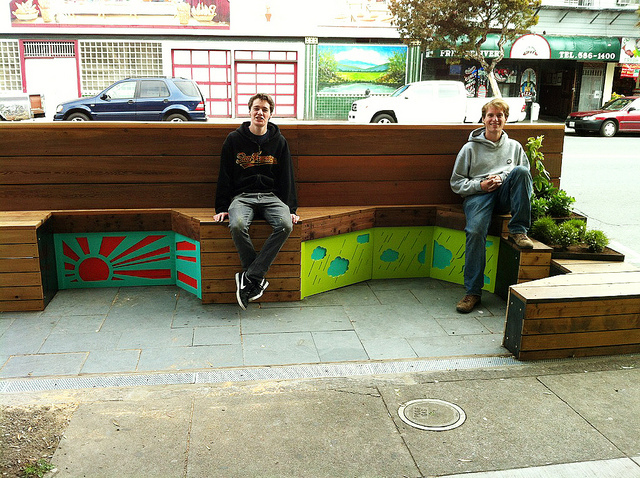 San Francisco is the leading model for the success of parklets. And a group called SF Pavement to Parks is advocating the concept with a lot of success. As an individual expression of a community’s character, parklets enhance neighborhood pride and identity. They can help de-emphasize the role of the automobile while elevating the status of pedestrian and biking transportation. Businesses, artists and citizens can foster cooperation by sponsoring a parklet together. Parklets provide outdoor furniture and encourage interaction between neighbors. They highlight the creativity of their sponsors with an artistic design or theme. They provide trees and other greenery to improve personal serenity and public health, which is especially important when more mainstream parks are far away. 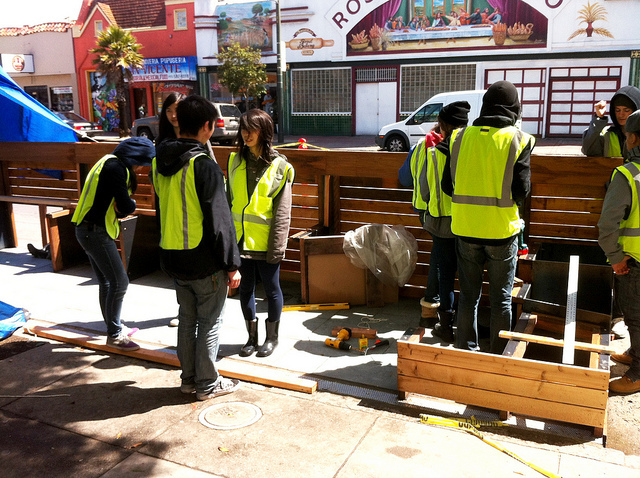 Parklets Build Community from SF Pavement to Parks on Vimeo.